Silver to light gray, files easily, light weight, and does not spark when held to a grinder. 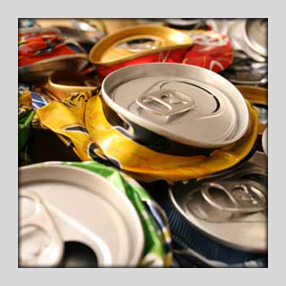 Aluminum Breakage: Any aluminum product with more than 2% contaminates. Lawn furniture, folding chairs, crutches, scooters (wheel & trim removed), and car trim. Cans: Pop or beer cans. Cast: Typically is unbendable, rough to the touch, and cracks under pressure. Cast is used in motor blocks and housings, transmissions and smal engine parts. Clip: Unpainted sheet, new production materials 1/4″ or less. Extrusion: Typically found in screen door and window frames. Old Sheet: Pots and pans, ladders, and radiators. Painted Siding: Exterior aluminum siding on houses.